Greetings from YFL!!! This is “Bonus Week” at the studio, which means a split week between the end of October and the beginning of November. As a result, this week’s practice will be “Sukha-Stirha”, or the blending of the energy forces of Yin and Yang!!! The Sanskrit focus is “So Hum”, or “I am”, eternally connected in the present moment to the energy of Source, Truth, and Well-Being. The mudra (hand gesture) is “Dhanya”, or the position of the hands for evoking a sense of contemplation and meditation focus. Our meditation focus is “To Be” in the present moment where life is lived. This week’s meditation music is “Divine Imagination” by Kiran Murti. PLEASE NOTE: YFL will NOT have its regular 6 p.m. class on 10/31 due to Halloween…Boo!!! Happy Halloween!!! The 4:15 p.m. class WILL MEET on 10/31. The studio is open the weekend of Veteran’s Day, but will BE CLOSED on 11/23-26, in observance of the Thanksgiving Holidays. Your monthly newsletter is filled with great info for yourself, your friends, and family, concerning the holidays. Feel free to forward and share the newsletter each month. This entry was posted in Uncategorized on October 30, 2017 by Deb Potts. Greetings from YFL!!! Happy Monday!!! We had so much fun celebrating our 11th anniversary at the studio last week!!! Thank you for sharing in the fun, and we express our deepest gratitude for your continued support of the studio, and our teachings!!! This week is Classic Hatha week, and the practice will emphasize a nice blending of the forces and energy of both power and flow. The Sanskrit focus is “Prasada”, or to sit in a “state of grace”, our gift from Source. The supporting hand gesture or mudra will be the classic Jnana form. This hand gesture connects us to the energy of “Universal Wisdom and Knowledge”. The meditation focus is “Light”, and may be your contemplative focus, as you listen to the music of David Lanz, and his “Blue Largo”. ATTENTION: Next Tuesday, October 31st, the 6:00 class WILL NOT MEET!!! Of course this is due to Halloween, and all the little Trick or Treaters!!! The 12:30 and 4:15 classes WILL MEET on that day!!! Have fun and be safe!!! This entry was posted in Uncategorized on October 23, 2017 by Deb Potts. To the Wall Week!!! Happy 11th Anniversary YFL!!! Greetings from YFL!!! Please come in this week, and help us celebrate Yoga For Life’s 11th Anniversary!!! Bring a friend, and you practice for FREE!!! Also, at each class you attend this week, you have a chance to win a COOL door prize!!! Come join the fun, 10/16-10/21!!! It is back to the “WALL” for our yoga practice this week. The wall provides a beautiful prop of resistance, and will align us, tone us, and strengthen us. It will also help us remain in the present moment, and totally connected between our mind and body!!! The Sanskrit focus is OJAS, or the energy of radiance and magnificence!!! Our mudra for the week is the hand gesture AKASHA, or the “Heavenly” mudra, which connects to “Truth” and “Source”!!! Our meditation focus is “Truth”, and trying to remain connected to that Source energy during our daily routine!!! The music for our mediation focus is Nuages Clouds by Tom Barabas. This entry was posted in Uncategorized on October 16, 2017 by Deb Potts. Greetings from YFL, and Happy Monday!!! This week’s practice will emphasize restoration!!! 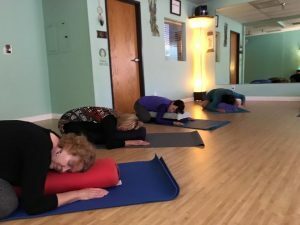 We invite you to come to your mat to restore, renew, and relax, as we REST UP!!! The Sanskrit focus is JNANA, or the yoga of wisdom, which promotes connecting to your emotional, physical, mental, and spiritual wisdom through the practice of yoga and meditation. Our mudra (hand gesture) is the BHRAMARA, or humming bee gesture. We add sound to this mudra, and this promotes relaxation, clearing of sinuses, and better communication. The meditation focus is the “Wisdom of Silence”, and you may choose to meditate to this week’s music selection, which is Sacred Earth’s “Bhakti Hreem”. It is hard to believe and humbling to realize that we will be celebrating our 11th year anniversary next week!!! From 10/16-10/21 we will join together to celebrate this mark for Yoga For Life!!! There will be door prizes, and FREE yoga for anyone that brings in a newbie to the studio!!! Come join the FUN!!! We are so grateful your support of offerings through these eleven years!!! Dhanya Vad!!! This entry was posted in Uncategorized on October 9, 2017 by Deb Potts. Greetings Yogis and Yoginis!!! Happy October!!! This week is “Weight Up”!!! We are going to sculpt, tone, and strengthen through the bearing of our own body weight, and with the use of light hand weights!!! Our Sanskrit focus is the Universal chant of AUM Shanti, Shanti, Shanti (Unifying Vibrational Energy and Peace, Peace, Peace). Our mudra (hand gesture) is the Ushas, which promotes connection to “All Things Good”. This week’s meditation focus is Shanti or Peace, and may be your focus, while listening to Ann Sweeten’s ” A Moment in Time”. Come to the mat this week to improve your power, strength, mental focus, and to reduce your stress levels!!! One last announcement concerning the Hurricane Relief Fundraiser that was held at YFL on 9/24!!! Our total collection was $2000, and was distributed to several organizations: Red Cross, UMCOR, Habitat for Humanity, Salvation Army, and the Humane Society!!! We thank you from the bottom of our heart for you generosity!!! Dhanya Vad (joyful gratitude and thanks)!!! 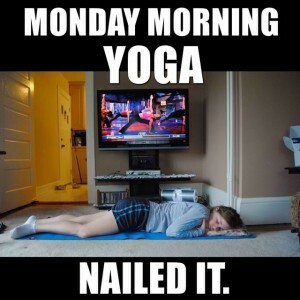 Nick’s new class, “Yoga For Teen Athletes” is in full swing on Monday’s from 6:45-7:45 a.m, and is open to all ages on Wednesday mornings at the same time slot!!! Come prepare for your sport, your academics, and for your overall well-being!!! The October edition of the YFL Newsletter was released yesterday via email. If you don’t receive our monthly publication, and would like to, then simply send me your current email address, and we will add you to the subscription list. We do not share your email with anyone!!! Our 11th anniversary of YFL will be celebrated 10/16-10/21!!! This entry was posted in Uncategorized on October 2, 2017 by Deb Potts.